If one of your direct relatives, such as a parent, sibling, or grandparent, has been diagnosed with Lynch syndrome, you may be at risk for the genetic condition and consequently, at an increased risk for developing cancer. If a family member has been diagnosed with Lynch syndrome, it’s important to learn as much as you can about Lynch syndrome and your own risk. Review your family medical history and find out which specific mutation has been identified in your family. Your relative with the diagnosis can provide valuable information to you regarding the known mutation, family history, and the next steps that he/she has been advised to take. 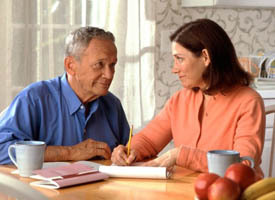 The next step may be for you or another family member to undergo genetic testing for the known mutation in the family. If a parent has Lynch syndrome, then you have a 50 percent risk of having inherited a Lynch syndrome gene mutation. The burden of responsibility for your health lies with you to take action and get tested to see if you carry the mutation as well and take any necessary preventive steps. Because your relative was diagnosed and not you, there is no physician or genetic counselor overseeing how this diagnosis may impact you. In fact, even if a physician or genetic counselor knows that one of your relatives has Lynch syndrome, The Health Insurance Portability and Accountability Act of 1996 (HIPAA) prevents them from disclosing this information to you, despite the fact that it could mean you have inherited the condition. HIPAA is a privacy rule that provides federal protections for personal health information. The HIPAA legislation provides a variety of different and worthwhile protections for consumers; however, one drawback of this important legislation is that it means healthcare practitioners are not at liberty to divulge private medical information about patients to the patients’ family members. In other words, if a direct relative informs you that he/she has been diagnosed with Lynch syndrome, you are now responsible for following up on this information. It is now more important than ever that you take responsibility for your own health and health information. If a family member has a confirmed diagnosis of Lynch syndrome, it’s important for you to act on this information. You may wish to schedule an appointment with your physician and/or a genetic counselor to determine the risks and benefits of undergoing genetic testing. Furthermore, you will want to contact other family members who may also be at risk. If a family member has been diagnosed with Lynch syndrome, you need to decide if you want to undergo genetic testing. At the very least, you should meet with a genetic counselor to review your family medical history, learn about Lynch syndrome and discuss the risks and benefits of genetic testing. To locate a genetic counselor in your area go to How to Find a Genetic Counselor. The decision to undergo genetic testing for Lynch syndrome is a personal and complicated one. It’s important to weigh the risks and benefits in order to make an informed decision that is best for you. If you are diagnosed with Lynch syndrome, it is important to share this information with direct relatives so that they can make informed decisions about their health. 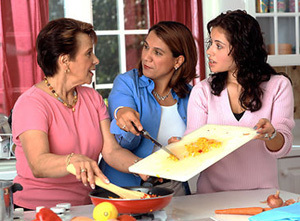 Your relatives may have no way of knowing that they have an increased risk of developing cancer. The information could prove lifesaving to family members, as it would allow them to employ screening and prevention strategies. A diagnosis of Lynch syndrome presents an increased risk of cancer; however, it also presents an opportunity—for screening, prevention, and risk reduction. Even if you opt out of genetic testing to confirm the presence of Lynch syndrome, your doctor may recommend more vigilant cancer screening for you based on your family history. Screening tests are tests that are designed to detect cancer prior to the presence of any symptoms. Screening for cancer helps ensure that cancer is detected in its earliest stages when it is most treatable. Furthermore, screening for some cancers, such as colorectal cancer, can also help to prevent cancer by detecting precancerous changes. Examples of screening tests include mammograms, colonoscopy and pap smears. Screening tests are not 100% accurate. Some screening tests are more accurate than others. Screening test results may incorrectly show positive for those without disease (false positive), or negative for people who have the condition (false negative). It is important to keep this in mind when undergoing screening for cancers. If you are having unexplained symptoms and have had a negative screening test it is important to talk to your doctor about your symptoms. To read about the different types of cancer screening tests please visit Managing Lynch Syndrome.